Large, seven-ounce blocks of our Mild Pepper and Provolone Cheeses are paired with a five-ounce stick of tangy Beef Summer Sausage and a box of Bremner Sesame Wafers. All are packaged with a handy knife on our black walnut and maple cutting board. A gift that will be enjoyed throughout the year! 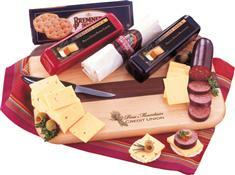 Food gifts are great for holiday gift giving and are ideal for sharing!